Box is at it again. Earlier this year the cloud service released an overhauled Box app for iOS, and today it's launching its similarly redesigned Android app. Box also announced an expanded partnership with LG. Box touts Box for Android 3.0 as one of the biggest updates for the app since it was originally introduced in 2010. The fundamental goal seems to have been to simplify the Box for Android experience, making it easier and faster for users to find and use the data they need. The document previewer in Box for Android 3.0 includes support for more than 100 file types, including Microsoft Office formats, and allows users to add comments files, search document text, and present PowerPoint decks from within the app. Box also developed a new image gallery that lets you zip through photos without having to wait for the full resolution versions to load. 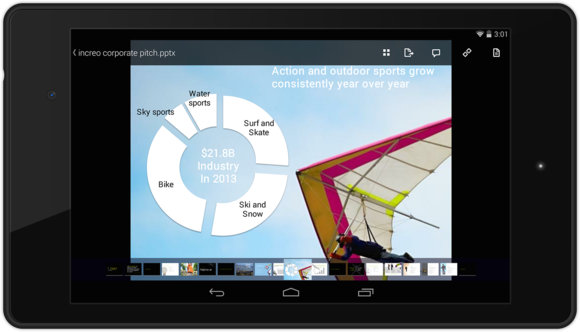 Box for Android v3.0 lets you run PowerPoint presentations right from the app. The redesigned app also makes it easier to find and use apps from its OneCloud ecosystem. 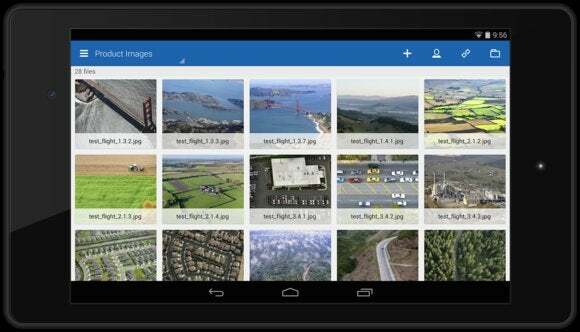 When you preview a file, the OneCloud gallery lets you see which apps on your Android device are compatible with that file type. Box has added a couple of apps to the OneCloud directory, as well: Documents to Go, a popular editing suite for Microsoft Office files, and Hall, a business messaging application. In addition to improving the app itself, Box has enhanced the ability for IT admins to manage the app on Android devices by extending support for MobileIron AppConnect. IT admins can deploy the Box app directly to remote Android devices and manage the app configuration and security using AppConnect policies. Box also announced an expanded relationship with LG, one of the leading manufacturers of Android smartphones and tablets. Similar to previous promotional offers from Box, any new Box user will receive a free 50GB account for one year when they download and log into Box for Android on any LG G-series device. Existing Box users will receive the upgrade for one year when they log into Box for Android on their G-series device. The offer will be valid through March 31, 2016. After the one-year expiration date, users will be downgraded back down to 10GB accounts. The new Box for Android 3.0 app is available for download starting today in the Google Play app store.